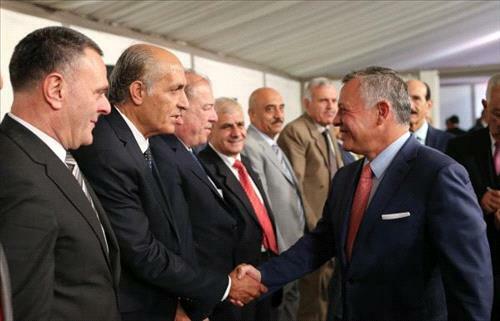 AMMONNEWS - His Majesty King Abdullah II on Wednesday met with a number of retired servicemen and veteran warriors and hailed their unceasing efforts and sacrifices in defending the nation and safeguarding its achievements. The King told the audience at the Royal Court that he was proud to meet with his brothers in arms, whom he was honored to serve with. "You have given my father King Al-Hussein strength, and you are constantly giving me the same strength. I am not worried of any conspiracy against the country with Nashamas like you," His Majesty said. King Abdullah voiced pride and confidence in the Jordan Armed Forces-Arab Army and said: "We highly appreciate the efforts of the armed forces and the security services working day and night to safeguard our borders and protect the homeland and citizens, and there is nothing fear about our borders." The King also commended the professionalism and courage of servicemen and women and their sacrifices in countering terrorist Khawarij who pose a threat to the region and to the whole world. He paid tribute to army and security agencies' martyrs who made the ultimate sacrifice while defending the nation. King Abdullah said the situation on the borders with Syria and Iraq had improved, and that work is underway to reopen the northern border soon, noting coordination with Iraq on the border issue. Speaking on local issues, His Majesty said that he had ordered the government to work quickly and transparently, and communicate with everyone to address economic challenges, alleviate the impact of hardships on citizens and improve the quality of services provided to them. Turning to the Palestinian issue, His Majesty reiterated that Jordan's position is firm and unwavering that there is no alternative to the two-state solution and the establishment of a Palestinian state with East Jerusalem as its capital. "Any proposal outside this framework is of no value," he said. "Every year, we hear about the confederation issue, and my answer is: a confederation with who? This is a red line for Jordan, and everyone knows Jordan's strong and courageous position on this issue. We have nothing to worry about here," he said.